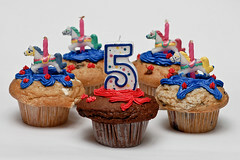 Five years ago today, June 25, 2005, I started this blog. I had seen a few other education blogs and websites, and I felt inspired to start my own. I found out quite recently that one of the people who inspired me to start my own site had to shut her site down because of an illness. The other site that inspired me to start mine is still around as a blog, but hasn’t been updated since January, and I don’t know if it’s down for the count or on an extended hiatus. Last year, I shared some statistics about my blog. Over the course of a year, a few things have changed. This post will be my 650th post. This blog has received 2,471 comments. Feedburner reports that I have 885 RSS feed subscribers, though site statistics like that are kind of hard to pin down. Feedblitz says that 104 people subscribe to this blog via e-mail updates. I know my Statcounter isn’t 100% accurate because I haven’t had it for the duration of my site, but it says that huffenglish.com has received 842,044 page views. A Hogwarts Education because it was really cool to be on the radio in Ireland, and I was really excited that Sean Moncrieff’s staff sent me an mp3 of my interview. Teachers and Facebook, which generated a lot of really good discussion. Double, Double, Toil and Trouble, which was a great opportunity to showcase my students’ work. Shakespearean Insults, in which the virtues of an iPod Touch for concocting Bard-inspired barbs are extolled. The Perils of Teaching the Books We Love, which describes my trepidation about teaching Wuthering Heights. P.S. It turned out OK. The students enjoyed my sharing that speech I wrote about how much the book means to me, and I converted one of my students! She told me that the book was her “new obsession.” She came by several times to talk about it with me. I also had a student from last year thank me for introducing that book to her; she said it remains a favorite. GCTE Conference 2010, which has a run-down of what I learned at that conference. It was a wonderful conference, not the least because I was awarded the Georgia Secondary Teacher of the Year award. The Journey, which describes my Hero with a Thousand Faces course. I Just Tried It, which discusses how we change our perceptions of learning and doing over time. Happy Birthday to your awesome blog! It's one of my favorites. Hope you're having a good summer, Dana! Thanks, Cheryl! Been working hard on my project. I will be glad to finish it so I can relax, but it's a fun project, so I am not complaining. Wow. What an awesome collection of writing and ideas and collaboration this is. Five years is a long, long time to look back on. Here's to at least five more! Congratulations, Dana! What an accomplishment–your blog has meant a lot to me, both as a teacher and blogger, and I'm so glad you are still going strong!